In the early 1960s there was no other Rugby League ground quite like the Barley Mow. Watching a Bramley home game at the ground was often an unforgettable experience for a number of reasons and some of those reasons had nothing to do with what was happening on the field. I was an occasional visitor to the Barley Mow and after paying my entrance fee (probably sixpence for a schoolboy) I then faced a couple of challenges. The first was trying to find a spot on the terrace where I could actually see all the action on the field. The second was deciding where to stand if it started raining. There was very little cover for spectators on a ground that, despite its ramshackle appearance, certainly did have a unique atmosphere. 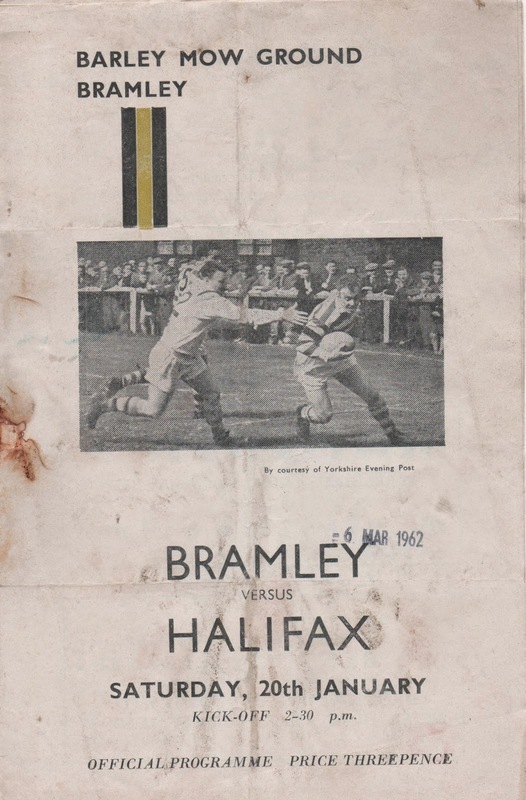 I was a Bradford Northern supporter in the 60s and so probably only managed to attend two or three games at the Barley Mow but one in particular, Bramley versus Halifax, played on 20th January 1962, is still memorable after over 52 years. I don't recall very much of the action on the field but I can certainly remember the players entering the ground from the changing rooms in the Barley Mow pub and the Bramley full back Jonny Wilson's contribution to the game. Jonny Wilson won the match for Bramley with the three penalty goals that made up the 6-0 scoreline. Two of the goals were kicked from the half way line, a remarkable achievement on a muddy pitch with a heavy ball. Wilson also kicked a number of huge touch finders which kept Halifax penned in their own half for much of the eighty minutes. 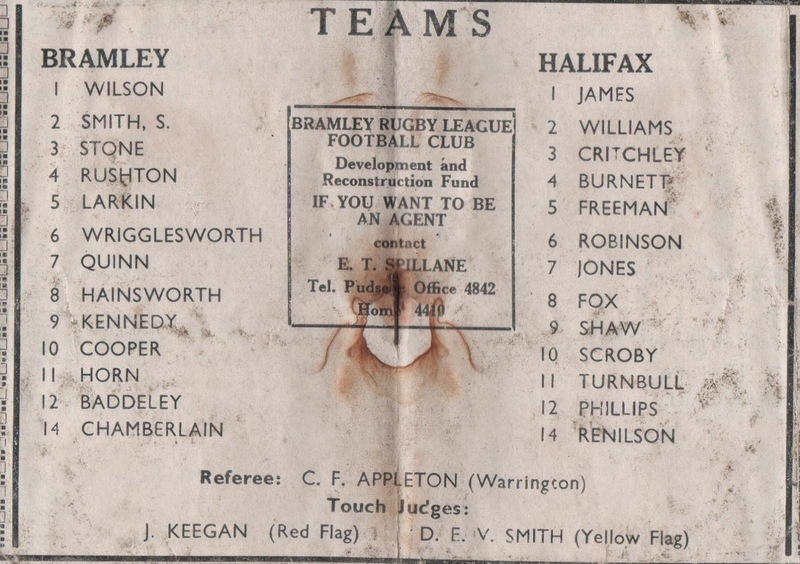 Jonny Wilson's main contribution to the game against Halifax was his kicking but as his goal kicks won the game, and probably a number of others, he was certainly a valuable member of the Bramley team. There were 2,870 spectators at the Barley Mow on that cold winter afternoon, an attendance that many of today's Championship clubs would be very happy with although, the receipts of £267 would certainly not cover the match expenses of a Championship club in 2014.